For most of our 2 week trip in Iceland we didn't see very many people: a handful here, a handful there, but it's a small Island and not very crowded. That all goes out the window when you head to the tourist area known as the Golden Circle. Our day started off grey, perfect for a day of waterfalls. We stopped at the beautiful blue tiered waterfalls of Bruerfoss, watched the geysirs blow at Geysir and then made our way to the raging waterfall of Gulfoss. You can see people in the upper right to get a sense of the scale of this thing. It's massive. 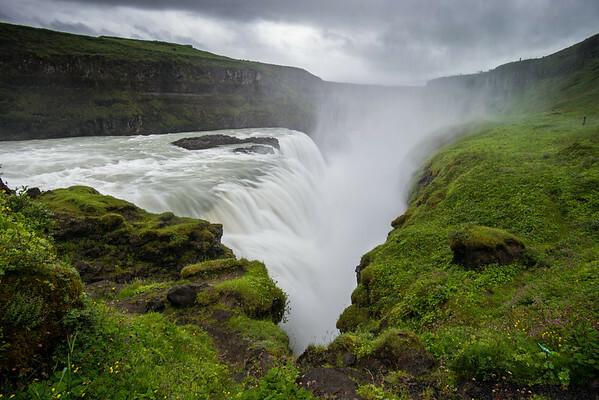 Gullfoss is really hard to shoot. There aren't many great viewing spots when you're getting sprayed with water everywhere. I tried far away. I tried close. I walked all around. In the end I liked the way this classic "V" brought the falls together as the path bends around and heads up towards the upper tier of the waterfall.